Just noticed this after I put up previous post a short while ago! 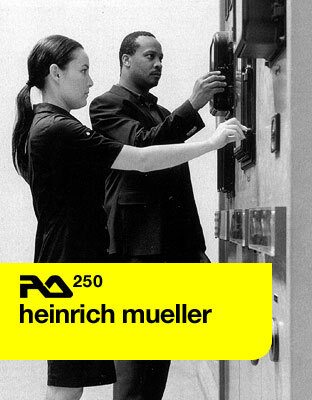 Heinrich Mueller and various members of Zwischenwelt have done a mix for Resident Advisor. There is also a short text interview with him and Penelope Martin which you can read in full there too at same link. When asked what he has been up to recently Mueller states, “Investigating new technologies and developing concepts for future works.” Something to look forward to there then. Tracklist below, you can see it includes not only Mueller tracks but also material from the Zwischenwelt collective and his wider associates. Vocal samples from the 2006 relativity and time-shifting lecture series made to promote Arpanet’s Inertial Frame album are used throughout. Most surprisingly the mix goes right back to mid 90’s Dopplereffekt material. All in all a very interesting and revealing mix made in what they refer to as the “Interworld”. You will have to join RA to download the mix. For archival purposes here’s the question and answer only part of their piece, see full article at link above. Mueller: Investigating new technologies and developing concepts for future works, all these things functions in a unified manner. They feedback to one another. Martin: Zwischenwelt's album production. We all worked really hard for this project, can't wait to see the album out. Also I have been concentrated on ArD2, a project I share with the Spanish producer Ekis. We just finished a new EP and shot a video for one of the tracks of the new EP. Nowadays I'm researching a lot, building the concept for a new project I want to start very soon. Martin: My lips are sealed on this one; all I can tell you is that the mix was created in the "Interworld." Mueller: Unsealing lips slightly. The assembly of this data was really a universal effort; building and exchanging ideas on its production. So there was no particular point in space/time where it was recorded, it was a theory and practice situation. It was truly a group and universal effort. We all were working toward the "Interworld" concept. Can you tell us a little bit more about the idea behind the mix? Mueller: The primary purpose of this music data assembly is to demonstrate the latest musical developments I'm involved with in addition to other musical workers. So in summary, it is a promotional demonstrator of music technologies. Martin: The idea was to demonstrate various new music concepts. We brought together music from other projects of Zwischenwelt's members and mixed it with some of the tracks we will find on the Paranormale Aktivitat album. Can you tell us about the production process behind the Paranormale Aktivitat. We understand it was mostly created via the Internet? Martin: Yes, we used the internet to organize the work; a lot of conferences where we all four shared new tracks, ideas and made the concept stronger. The Zwischenwelt LP took quite a long time to complete. I got involved in the project in May 2007. Along those years I had to travel to Germany twice, for real time sessions—a great experience where we all share ideas under the same ceiling. Mueller: At this time as stated previously, looking forward to new technologies and concepts, maybe some possible interactivity with other musical scientists to share ideas. Martin: I'm setting up the foundations for new projects, researching and preparing rhythms and ideas. We are working on a live set for ArD2 as well as new tracks. Also I am looking forward to a more personal with no collaborations, just me as Penélope Martin. Seems like the registration is broken at that site. Who's Neuroleptica? Never heard of it?? Interesting track though. Lovin' the whole mix ! Ok finally managed to register, love the mix, really nice surprise. see facebook "globe deutsche bank"
that neuroleptica track sounds soooo heinrich mueller. maybe is a new project about nerves or brain i don't know.